What your printer and post office doesn’t want you to know! Remember when we were kids? When summertime was full of free time and frozen treats. Those easy days when we could dream up the wildest, most fantastic ideas that had no boundaries…or budgets. As designers and marketers (and sadly, now adults), we sometimes catch a wave of inspiration that pulls us into a big idea, but before we get carried away we stop ourselves. Budgets, timelines, and the general fear of the unknown can keep us from acting on those big ideas, especially when it comes to direct mail. As one of our oldest institutions, the mail process has surprisingly been able to maintain an air of mystery for many of us. How much will this cost to mail? How long will this take to get there? Will the packaging hold up? In a world reliant on ROI, these unknowns can quickly squash the most sound direct mail strategies—and that’s even before we’ve received pushback from our printer*. Unconventional ideas will always be challenged, as what’s standard and comfortable is usually cheaper and easier. 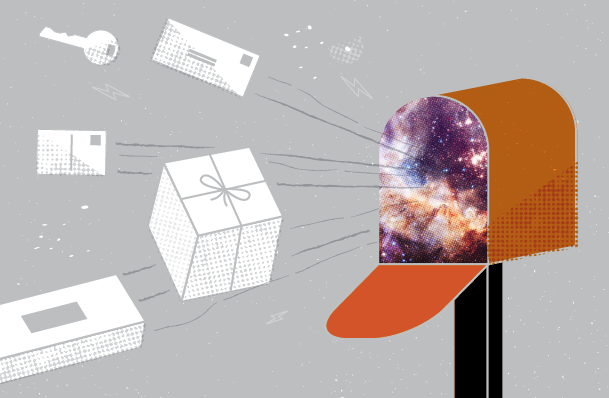 Your printer and post office may challenge your big direct mail ideas, but we’re here to reassure you and share the truth about direct mail so that you can conceptualize with confidence. Whether you need an envelope enclosure or are thinking about a self-mailer, you don’t have to pick an off-the-shelf size. There are set, standard sizes for what is machinable by the Postal Service if you want to save money, however the shape and size of your piece can be the difference between getting put on the top of the stack or tossed in the trash. It is also possible to stay within the size guidelines for ease and cost savings and still create uncommonly sized pieces, so don’t let these hold you back. Envelopes don’t stop at #10. Your printer may discourage you from creating an unusual or custom sized piece as well in an attempt to help keep your costs down or to make you use what they have in stock. Occasionally a printer will even pushback on a preformatted envelope request if the size is uncommon and one they’d have to order or make custom. If the unique size of your direct mail piece is important enough to your concept and to the success of the campaign, it is worth fighting for. You can mail anything. Sort of. Did you know you can mail a potato? No really, there are at least four different websites you can go to right now that will mail someone a potato for you. As long as you have the correct postage and are not mailing something that’s explicitly prohibited, then go for it. Last summer we mailed a bunch of orange pool noodles, so we can vouch for this. There is more paper than what’s on the shelf. Next to the physical size of the direct mail piece, paper also plays an important role in the first impression. Selecting the right paper can be an intimidating process, not to mention your printer might also be trying to nudge you towards something standard and off-the-shelf. Don’t be a paper pushover and settle for something that doesn’t fit your brand. There are a number of resources for specialty preformatted envelopes and seemly endless paper options to choose from for your mailer, so it is worth your time to work with your printer and get what you want. With all of these obstacles and perceived parameters to direct mail, it’s no wonder people turn to digital solutions to reach their audience. Although digital marketing can be highly effective and the best method in some instances, the inclusion of a print campaign could be the right move to break through the clutter. Plagued by incessant pop-ups and overflowing inboxes, our audiences have all but tuned us out online. It’s a touchy subject amongst creatives, but we still believe physical, tactile print design is an important part of a balanced marketing strategy. So this summer go out, have a poolside brainstorm with a popsicle, and dream big about your next direct mail strategy. The sky’s the limit! *Note: All this being said, it may seem like we’re giving printers a hard time—and as a company that still does a decent amount of print work, the last thing we want to do is knock our printer friends. Not every printer will be inflexible and pushback against out-of-the-box ideas. We feel it’s important to have a print partner that you trust and that understands your goals and expectations. A great printer will not only welcome your ideas, but will work closely with you to execute a successful direct mail campaign that meets your objectives and brings home a win for you and the client.